No more uncomfortable headphones or in-ear headphones. Meanwhile, numerous ideas, concepts, prototypes and marketable products have been developed to combine two everyday topics – our apparel and listening to music. Nowadays, many people listen to music, podcasts or to the radio with their smartphone. With electronic components woven into the flexible fibres or into our clothing, there are now more and more alternatives to customary hardware. The music we listen to can just as well come from our sweater’s hoodie, with the volume being controlled via sensors in the jacket sleeve instead of buttons on our smartphone. Here, we present some interesting innovations from the field of music wearables. 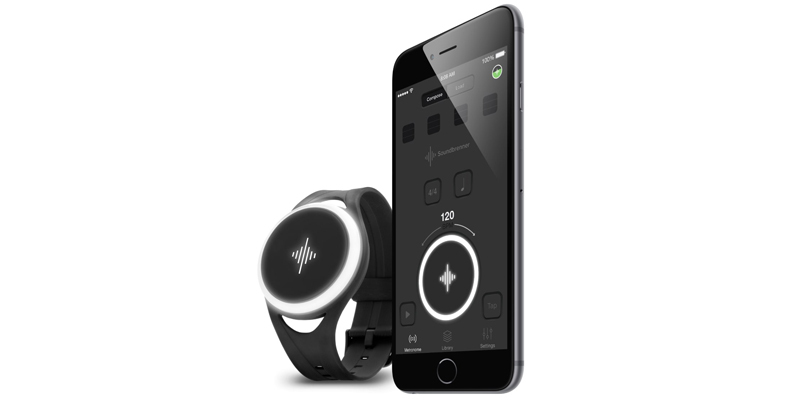 The Soundbrenner Pulse is a wearable metronome that vibrates in tempo. This concept may sound simple, but behind it is a sophisticated technology. The wearable can be worn on the wrist, around the arm, chest or foot – just the way you want it. It serves as a metronome and can be connected and synced up with up to five units via Bluetooth. A smart music gadget that sets the pace both in terms of music and innovation. In cooperation with Ramyah Gowrishankar and Sebastian Wolf, Dr. phil. Katharina Bredies has developed and implemented the concept for a cap in the framework of the Design Research Lab of the Berlin University of the Arts. The Wavecap is a knitted cap with a radio that is integrated into its lining. The gadget can be controlled through various embedded sensors. There are no rotary switches or buttons in the traditional sense, instead a string in a hem can be pulled to increase and decrease the volume. Pulling the right string with the pompoms increases the volume, and pulling the left string decreases it. A bell on top of the hood serves as a control to change the sender and browse through the frequencies. The speakers are hidden in small pockets next to the hood. Another innovation from the Design Research Lab in Berlin is the Sound Hoodie by Sara Diaz Rodriguez and Dr. phil. Katharina Bredies. The hoodie contains a Bluetooth speaker module that can be connected wirelessly to a mobile phone and play the favourite music of its wearer. The hoodie can be wrapped around the neck and fixed with two hooks. A blue LED indicates that the speaker is on and running. The module is placed between two layers of knitted fabric and connected to snap buttons. An inductive coil allows wireless charging. Beanies and headbands by earebel help keep your head and ears warm while delivering excellent sound. The embedded speakers are visible and thus present a key style element. As the speakers are removable, the earebel headgear is washable. Didi Hirsch and Manuel Reisacher from Immenstadt developed the smart music wearables. 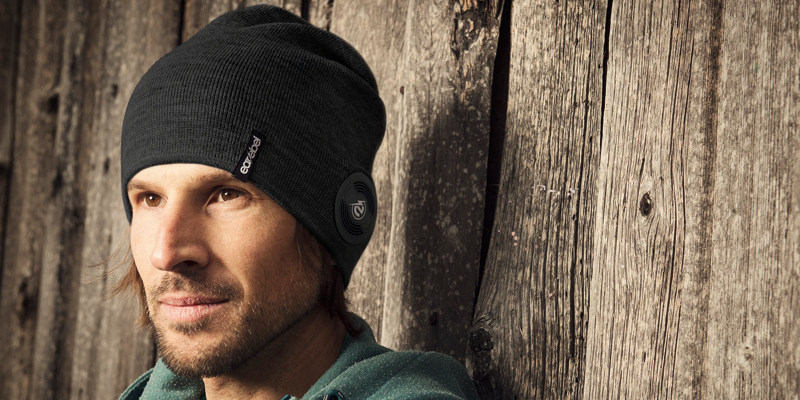 The Lifestyle collection includes fine-knit beanies with headphones. The Sport collection is made of breathable Climayarn or a synthetic polyamide/spandex blend, and is therefore suitable for all workout activities and a great sound. The Handmade collection supplements its range with hand-knitted pieces made from pure new wool or an Alpaca and acrylic yarn blend. The device is connected to the mobile phone via Bluetooth, allowing the wearable to play any title you want to hear. Sharon Greenberg, Roman Alperovich and Einat Israeli from Haifa in Israel add interactivity to any apparel or accessory in order to enable the mobile-first generation to focus on the experience, on the here and now, while being on the move. 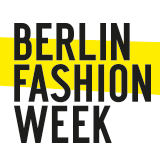 With the Keypod, the designers developed a mini device that was awarded the first prize at this year’s Telekom Fashion Fusion in Berlin. The Keypod provides smart communication features and enables the use of music streaming services or sending voice messages without taking the mobile phone out from the pocket. This is especially useful while exercising. The Keypod can be integrated into almost any accessory or apparel to make it interactive and connected. The revolutionized embedded unit is small, light, washable and has years of battery life. The music gadgets of the smart generation are wearables creating a whole new music experience.